Maybe you'd do better on Jeopardy! than you thought you would...at least, if the categories are music-related. 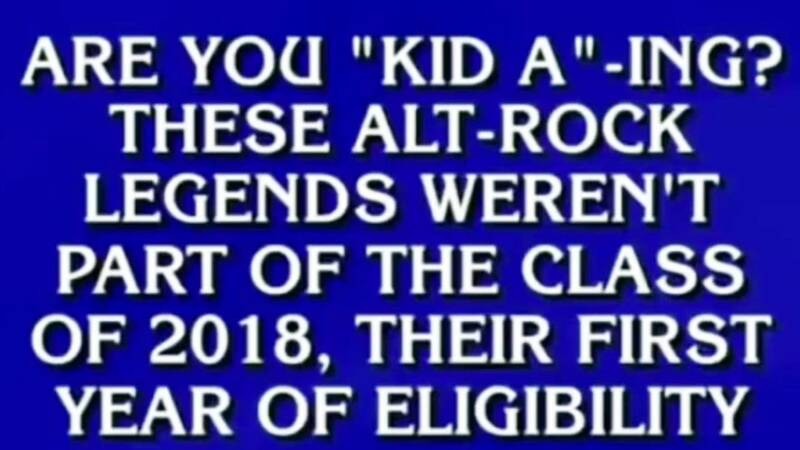 Wednesday night's episode of the long-running quiz show featured a category called "Not in the Rock and Roll Hall of Fame," and the three contestants did okay at it — except for the $1,200 question, above. John Legend has launched a rosé line — as in, the wine. It's actually his fourth signature wine, and his partner, vintner Jean-Charles Boisset, says the singer-songwriter is a true wine pro. "Typically we say no to any celebrity client," says Boisset. "Typically, they're not as intensely into wine, not as dedicated to wine and winemaking." Not to be outdone, Margo Price is launching her own marijuana strain. Her partner in the enterprise, of course, is legendary musician and pot-smoker Willie Nelson. Price's weed will be a signature strain of Willie's Reserve.